Microsoft certifications cover a wide range of professional roles and attest objectively the skills of those who have achieved them. Adopted by industry professionals worldwide, Microsoft certifications are one of the most effective tools to achieve long-term professional goals, while allowing companies to develop and retain a competent IT staff. View the Microsoft Certification chart below that shows the paths and levels of all the Microsoft certifications as well as the Microsoft Digital Badges that you can receive. Click here to view our Microsoft Certification Guide. Microsoft is partnering with Acclaim to award badges for your certifications. Your digital badge allows you to easily share the details of your skills in a way that is trusted and verifiable. 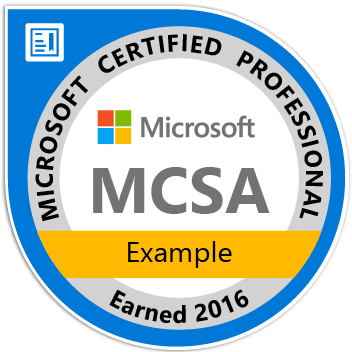 Badges are web-enabled representations of your Microsoft certifications. Your digital badge is made of an image and metadata uniquely linked to you. This ensures that only you can take credit for your achievement. Easily share your certification online with your professional network. Find out which employers are looking for individuals with your skills. Discover what kind of salary you could expect to earn in a job that requires your Microsoft skills. Search for new job opportunities associated with your certification. MCPs who pass the exams or achieve the certifications on the following list, on or after October 21, 2016, will receive badges. Beginning in November 2016, badges will be retroactively issued to those who passed the exams or achieved the certifications prior to October 21, 2016, beginning with those certifications which are still active. Select the link in your Acclaim email notification. Create an account on Acclaim. Acclaim sends you a confirmation email. To confirm your account and claim your badge, select the link in that email.